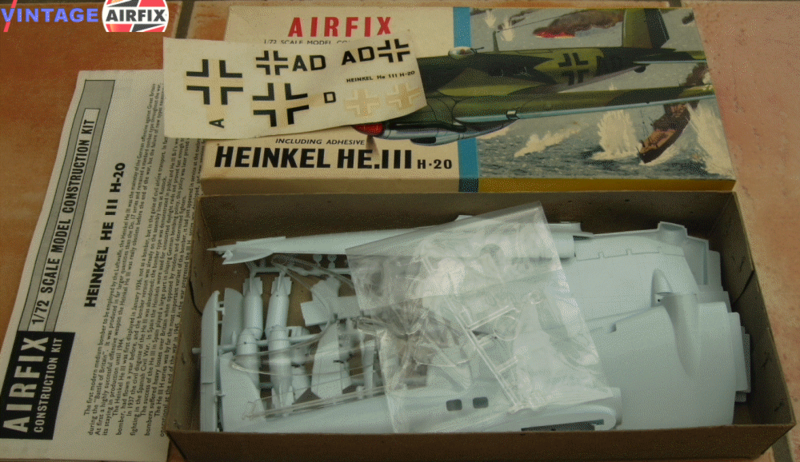 All the care and attention to detail given to every Airfix model has gone into the 79 parts of this kit. Consequently the model it makes is an excellent scale reproduction of the famous German medium bomber. The HE 111 was used extensively by the Luftwaffe in World War II. In fact it was the HE 111 that was the mainstay of the German offensive against Great Britain during the "Battle of Britain". However, this particular model, the H-20 was used mainly on the Russian front. Powered by two Junkers Juno 213 engines it had a top speed of 295 m.p.h., and a service ceiling of 32,800 feet. Maximum bomb load was 8,000 lbs. and defensive armament consisted of three MG 131 13mm. machine guns and twin 7.9mm. machine guns in each of the two beam positions.